The MSC "QI" Wireless charging pad allows compatible devices to charge their batteries simply by placing the device on it. 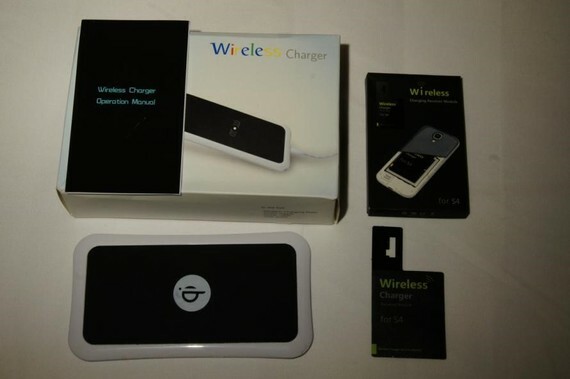 The wireless charging is comparatively quick when compared to direct (mains) charging and the charging station can be left plugged in permanently taking very little current itself. After 2 weeks usage I can't really find any fault with the device itself, but have had to change a few peripheral components. The charging pad a white plastic unit 83mm wide X 153mmlong X 7mm thick. It has a charging power status LED in the bottom left corner, and a micro USB slot in the bottom edge for connecting to the now de-facto (de-rigeur?) "standard" USB style power supply (or to a PC charging hub). The unit is a bit flexible bendy but seems up to general day to day use. The majority of the facia is covered by a rubbery black charging area stamped with the QI logo. The rubber does go some way to stopping the 'to-be-charged' device from moving around too much but is not 100% foolproof (see below). When the charging pad is receiving power, the LED glows green. When it is charging a device, it turns blue. There is no audible power charging queue from the charging unit at any point. The S4 charging receiver in this instance was a small (47mm wide X 82mm long x 1mm thick) package of electronics wrapped up in a plastic-y shell. The only elements exposed were a bit of circuitry and the two pins that fitted neatly into the charging holes in the Galaxy S4. The bulk of the package contained the receiving coil that fitted against the S4's battery. The receiver also had a sticky area (covered by a removable film) that allowed the unit to stick to the battery meaning that it was less likely to move when fitting or removing the phones back cover. Some phones already come with wireless charging receivers already built into them. The Samsung Galaxy S4 does not but allows compatible wireless receiver modules to be installed by the user. Following the "printed-on-the-receiver-itself" instructions was easy enough with the whole operation completed in about 30 seconds. Remove the back cover of the phone exposing the battery etc..
... Do not place the phone in the thick leather carry case*. ... but there are a few "However's" and "Gotchas". When the Galaxy S4 is charging wirelessly a notification is displayed and a "trill" is sounded - This is vendor specific so this may or may not occur for other brands of phone. When the phone stops charging, no notification is displayed and no sound is played. Although quite thin, the receiving unit added to my phone did push the back cover out a little bit making it slightly convex. The upshot of this is that the phone was more prone to spinning around or being moved if the device or table it was sitting on was knocked. The base units grippy rubber surface did help reduce slight wobbles and accidental knocks but as the back cover of the S4 is quite slippery shiny, it didn't completely remove the spinning effect. The lesson here is to make sure the phone can't be accidentally knocked. Charging only occurs if the receiver is lined up with the charging "element" of the base unit. If the device is not sitting squarely on the charging pad initially, charging may not take place. Experimentation showed that so long as the receiving unit was directly and completely on the charging pad, charging took place (squarely on or 90˚ to the charging unit worked best). Once the device has been recognised and is charging the device can move around quite a bit (~30˚ from original position) and still be charged; If the device moves beyond this angle the charging "signal" is lost. If the device is rotated back round again (to within 30˚) it still may not be recognised. The safest bet is to remove the device and re-seat it. The assumption is that the further apart the transmitter and receiver, the less "signal" found to start the charge. Replacing reseating the device on the pad returns to the strongest signal and charging restarts. In the notes above I mentioned "do not put the phone back in its thick leather cover". This is because the charger and receiver need to be in very close proximity to each other; If they are too far apart, the receiver cannot receive a charge. i.e. 20 sheets - Occasionally charges but mostly does not find the receiver. ... but the upshot is that if you have a thick leather carry case, (for example bought to stop the phone being scratched and damaged when it falls out your shirt pocket and onto the rocky outcrop you are balancing on when you lean forward to photograph a particularly nice example of Salticus scenicus), the charger may not work. In addition, the thin cover case that I had to hand did not have a hole in the cover for the camera phone - This was particularly aggravating as I still use my Daily Roads Voyager Dash-Cam; As my case did not have a hole for the camera, I could not fold the cover back without blocking the rear facing camera - Upshot, I have to purchase a new thin cover that does not obscure the camera when it's in its car cradle. 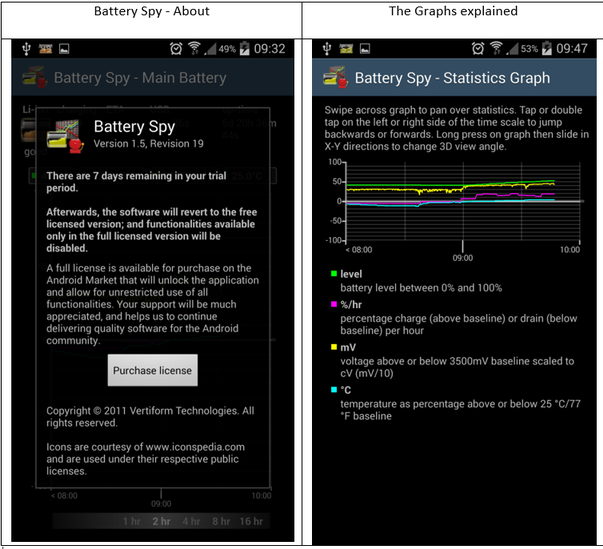 To observer charging rates between mains powered charger and the wireless charger, I downloaded and installed Vertiform Technologies Battery Spy from the Google Play Store. The idea was to use the application generated graphs to observe any key differences between charging via mains and wireless charging. These are observations only as I did not have the appropriate equipment or processes to conduct a formal test. Cable used in both runs was the Standard Galaxy S4 charger supplied with the phone. As expected, the mains charger provided a bigger charge (59.5% of base at peak) and thus charged quicker, but given the convenience of just putting the device on the charger unit it allows the device to be charged more frequently. Once charge reaches 100% the charger reduces to a trickle charge keeping the device topped up. This review is intended to highlight the benefits and limitations of the item(s) under review, not provide details on how to use it. Where notes on use are provided, these are the reviewers observations at the time of review and may not necessarily represent the best, easiest, recommended or proper use of the items.